To evaluate the effect of transrectal ultrasound-guided prostate biopsy on lower urinary system symptoms. The study included 123 patients who underwent ultrasound-guided prostate biopsy between March 2013 and December 2013. Before and at 2, 4, and 8 weeks after the procedure, the patients completed the International Prostate Symptom Score (IPSS) questionnaire. Storage symptoms (questions 2, 4, 7) and voiding/postvoiding symptoms (questions 1, 3, 5, 6) were separately evaluated. The patients with cancer diagnosis were excluded after the week 4. The cancer-free patients were divided into subgroups based on education level and complication status and followed for 8 weeks to assess changes in IPSS and quality of life. IPSS increased significantly at week 2 follow-up of both the cancerous and cancer-free patients (p=0.041 and p<0.01); however, there was no statistically significant difference between the pre-biopsy scores and week 4 scores (p=0.07 and p=0.09). Voiding/postvoiding symptoms also increased significantly at week 2 for both groups (p=0.04 and p<0.01, respectively). IPSS was significantly higher in all subgroups of cancer-free patients at week 2, in correlation with voiding/postvoiding symptoms. In patients with low education level, there was a significant decrease in IPSS at 4 and 8 weeks compared to pre-biopsy (p=0.031 and p=0.035, respectively). IPSS changes were not associated with prostate volume. Quality of life was significantly reduced in the early period (p<0.01). Lower urinary system symptoms are affected negatively in the early post-biopsy period in correlation with the increase of voiding/postvoiding symptoms. The time required for remission is 15-30 days. The procedure may decrease symptoms in patients with low education level due to the placebo effect. Since it was first practiced by Hodge et al. (1) in 1989, transrectal ultrasound-guided prostate biopsy (TRUS-Bx) has been accepted as the standard diagnostic method for prostate cancer. Over 900,000 men worldwide are diagnosed with prostate cancer each year. Approximately 75% of diagnosed cases are reported from developed countries where prostate-specific antigen (PSA) testing is widely used and followed by prostate biopsy (2). Currently performed on more than 1 million patients per year in the United States of America and Europe, TRUS-Bx has become one of the most common procedures in urology practice (3). Although TRUS-Bx is the standard method for the diagnosis of the disease, it can lead to various postoperative complications such as hematospermia, hematuria, rectal bleeding, urinary retention, urinary tract infections, and urosepsis (4,5,6,7). There are opposing views in the literature about the effects of TRUS-Bx on postoperative lower urinary tract symptoms (LUTS) (8,9,10,11). Our aim in this study was to evaluate patients undergoing TRUS-Bx preoperatively and postoperatively to determine the effects of the procedure on LUTS. The study included 123 patients who underwent TRUS-Bx for the first time between March 2013 and December 2013. 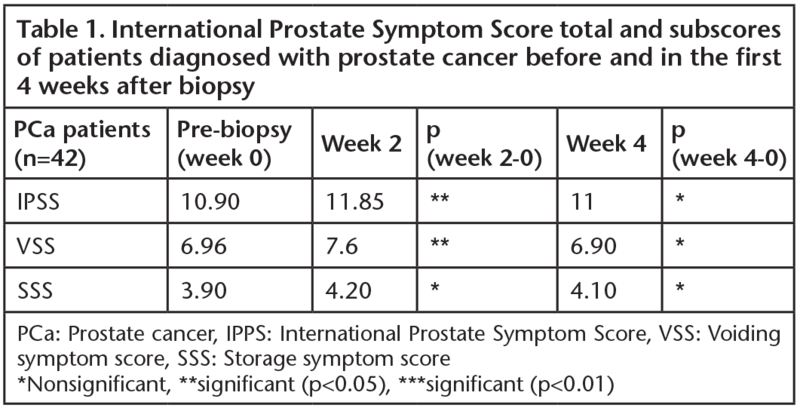 LUTS were assessed based on the International Prostate Symptom Score (IPSS) before and at 2, 4, and 8 weeks after the procedure. Approval for the study was obtained from the Ethics Committee of University of Health Sciences Bursa Yüksek İhtisas Training and Research Hospital (ethics committee date: 25/09/2013 and approval number: 2013/9/25). All patients included in the study signed an informed consent form. Indications for prostate biopsy used in this study were abnormal rectal examination findings and/or serum PSA levels above 2.5 ng/mL. Patients with urinary catheters prior to the procedure and those receiving medical treatment due to LUTS were excluded. In addition, medical treatment was initiated for patients whose IPSS was 20 or above before the procedure, and this group was also excluded from the study. None of the patients were given medical treatment due to LUTS after the procedure. Complications that developed after the procedure were classified according to the Clavien grading system. Patients who developed Clavien grade 2 or higher complications (urinary retention, infection symptoms, macroscopic clotted hematuria) were excluded from the study. Urine cultures from all patients were studied prior to the procedure. Patients with growth in urine culture were treated with appropriate antibiotherapy; after achieving sterile urination, PSA level was measured again and the need for biopsy was reevaluated. The IPSS, one of the most commonly used questionnaires in urology, was used to determine the effects of the TRUS-Bx procedure on LUTS. The patients’ IPSS questionnaires were analyzed in 3 different ways to obtain an IPSS total score, storage symptom score (SSS) (questions 2, 4, and 7), and a voiding symptom score (VSS) (questions 1, 3, 5, and 6). The IPSS item regarding quality of life, scored between 0 and 6 points, was used to assess whether possible changes in IPSS after TRUS-Bx affected the patients’ lives. Patients’ ages, PSA levels, and prostate volumes were recorded and their association with postoperative LUTS were evaluated. After pathology results returned, patients with benign pathology were divided into subgroups based on their education level (primary school and below, high school and above) and whether they had complications. Scores for all subgroups at each time point were calculated and changes were evaluated. Patients diagnosed with cancer were evaluated as a separate group and only in terms of the IPSS total and subscores. All patients were prescribed oral ciprofloxacin 500 mg twice daily starting the day before TRUS-Bx and continuing for 3 days afterwards. All patients underwent bowel cleansing by intrarectal enema on the morning of the procedure. Oral analgesics were also prescribed for use within the first 3 days after the procedure. For the TRUS-Bx procedure, patients were placed in the left lateral decubitus position, with the hip and knees flexed. Intrarectal 2% lidocaine gel was applied to all patients for local anesthesia. A 6.5 MHz rectal probe with a maximum diameter of 23 mm was used with a General Electric LOGIQ 100 PRO® series ultrasound device for TRUS imaging. Twelve-core biopsy specimens were taken from each patient using a 30 cm 18-gauge fully automatic biopsy needle. Nonparametric statistical tests were used because the variables did not conform to normal distribution. The Mann-Whitney U and Kruskal-Wallis tests were used for between-group comparisons, the Wilcoxon test was used for dependent samples, and chi-square and Fisher tests were used for categorical data. A p value of <0.05 was accepted as statistically significant. One hundred twenty-three patients who presented to our outpatient clinic and underwent TRUS-Bx for suspected prostate cancer were prospectively evaluated in this study. The mean age of the patients was 61.9 (38-75) years, mean PSA value was 12.73 (2.1-75.3) ng/dL, and mean prostate volume was 65.4 (20-310) cc. Pathologic diagnosis was benign in 81 patients (65.8%) and malignant in 42 patients (34.2%). Patients diagnosed with cancer could not be evaluated at 8 weeks because they were referred for definitive treatment after week 4 of follow-up. Table 1 summarizes the first 4 weeks of evaluations of the patients diagnosed with cancer. Analysis of IPSS subscores showed that total scores and VSS increased significantly at week 2, while at later time points there were no statistically significant differences compared to preoperative values in any category. 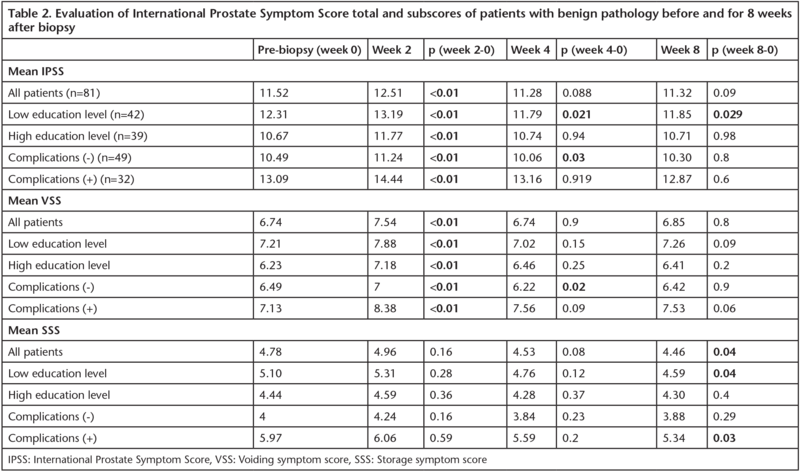 IPSS subscores of the patients with benign pathology and their subgroups over the 8-week follow-up period are shown in Table 2. When all patients were assessed, there was a statistically significant increase in total scores at week 2 (p<0.001). When the patients were evaluated in terms of SSS and VSS, it was seen that the higher scores during initial follow-up were primarily due to a statistically significant increase in VSS (p<0.001). At 4 weeks and 8 weeks after the procedure, total scores were not significantly different from preoperative values. When analyzed based education level, there was a significant increase in IPSS total and VSS in both groups at 2 weeks. At 4 and 8 weeks, a statistically significant drop in IPSS total score compared to preoperative values was noted among patients with an education level of primary school or lower, while no significant difference was found in patients with high school or higher education. The patients were divided into two groups based on the development of complications after the procedure, which were graded according to the Clavien classification. Thirty-two patients developed complications: 10 patients had hematospermia, 9 had hematuria, and 13 patients had 2 or more complications (Table 3). IPSS total and VSS increased significantly at week 2 follow-up both in patients with and without complications. At week 4, IPSS total and VSS fell significantly in the group without complications, and by week 8 there was no statistically significant difference in IPSS compared to preoperative values in either group. The quality of life item revealed a significant decrease among patients with benign pathology and their subgroups at week 2, but it returned to preoperative values in later time points (Table 4). No correlations were found between the patients’ ages and prostate volumes and their score differences at the follow-up time points. Abnormal findings on digital rectal examination and elevated PSA values suggest the possibility of prostate cancer. Prostate needle biopsy is the most commonly used diagnostic method for the definitive diagnosis of these patients, and a pathological diagnosis of prostate cancer is established by TRUS-Bx in most cases (12). In the current American Urological Association guidelines, TRUS-guided 12-core biopsy that includes the distal lateral regions and the apex is recommended as the optimal initial biopsy method (13). A recent meta-analysis shows that multiparametric magnetic resonance imaging-guided biopsy is superior in the diagnosis of clinically significant prostate cancer (14). However, due economic factors and the fact that this procedure both takes longer and is not very widespread, TRUS-guided systematic biopsy is still accepted as the standard diagnostic method for prostate cancer. The invasive nature of TRUS-Bx and especially the transrectal approach make certain complications possible. The patient and the physician should be prepared in the postoperative period, because the procedure can affect an individual’s activities of daily living. Klein et al. (8) evaluated postoperative LUTS in 198 patients who underwent TRUS-Bx for suspected prostate cancer. They divided the patients into 3 groups and used intrarectal lidocaine gel alone in the first group (71 patients), periprostatic nerve block in addition to intrarectal lidocaine gel in the second group (74 patients), and periprostatic nerve block alone prior to saturation biopsy to the third group (53 patients) who had previous negative biopsies and persistent elevated PSA. The patients were evaluated using the IPSS before and at 1, 4, and 12 weeks after the procedure. Each group showed an increase in IPSS at week 1. At weeks 4 and 12, this increase disappeared in the first group, persisted but was statistically nonsignificant in the second group, and persisted significantly in the group that underwent saturation biopsy (8). The changes in IPSS observed in our study are consistent with the study by Klein et al. (8). While patients’ LUTS increased in the early post-biopsy follow-up, in subsequent follow-ups they did not differ significantly compared to pre-biopsy levels. To the best of our knowledge, there are no studies in the literature which evaluate IPSS subscores. As a step further from the study by Klein et al. (8), in our study we separately categorized and evaluated the IPSS items regarding voiding symptoms and storage symptoms. The statistically significant increase in voiding symptoms in the early period was thought to be due to inflammation and edema in the prostate tissue due to the biopsy procedure. Our findings indicate that a period of 15-30 days is required after the procedure for the prostate edema to subside. In another study, Helfand et al. (9) used pre- and post-biopsy American Urological Association Benign Prostatic Hyperplasia Symptom Score data to assess the LUTS of 85 patients who underwent 12-core TRUS-Bx for suspected prostate cancer. No statistically significant difference in LUTS was found when the lower urinary tract functions of all patients and those diagnosed with prostate cancer were analyzed before and after the procedure (9). Although our study is similar in that the tissue diagnosis was not associated with post-biopsy course, our findings differ from those of Helfand et al. (9) in terms of the effects of the procedure on LUTS. In a study by Fujita et al. (10) published in 2009, 231 patients diagnosed with prostate cancer and under active surveillance were followed to assess the effects of serial biopsies on erectile function and LUTS. There were no statistically significant differences between IPSS values before and at 1 week after the procedure (10). Unlike the study by Fujita et al. (10), in our study we evaluated patients undergoing biopsy for the first time and were able to follow patients with cancer for only 4 weeks. Although the patients were not assessed with a questionnaire measuring anxiety, we observed changes in the emotional state of patients during the interviews. Similar to the patients in the benign group, the IPSS results of patients diagnosed with cancer did not differ significantly at week 4 follow-up compared to their pre-biopsy scores. This indicates that a cancer diagnosis and the resulting anxiety are not associated with any additional changes in LUTS after biopsy. To the best of our knowledge, there are no studies in the literature showing the relationship between patients’ education level and changes in LUTS after prostate biopsy. In our study, there was an increase in LUTS at week 2 in both the higher and lower educated patient groups. Subsequent follow-ups revealed a statistically significant drop in the IPSS of the lower education level group compared to pre-biopsy values. We believe this was due to the procedure being perceived as a treatment and creating a placebo effect, and while this effect can also be observed in patients with high education levels, it is more common among patients with a low level of education. In the present study, we graded the complications developed after TRUS-Bx according to the Clavien classification. As in some other studies, hematuria lasting more than 3 days, hematospermia lasting more than 3 days, and rectal bleeding lasting more than 24 hours were graded as Clavien grade 1 complications (15). Predicting that high-grade complications such as macroscopic clotted hematuria and infectious conditions would definitely result in higher scores, we considered it appropriate to exclude these patients from the study. The relationship between pre-biopsy and post-biopsy week 2 and 8 scores of the patients with complications was similar to that seen in the assessment of all patients in our study. According to our results, low-grade complications that develop after the procedure do not influence LUTS. In light of our findings, we believe that low-grade complications should be regarded as a natural component of the post-biopsy period. Studies examining the effect of prostate volume on post-biopsy IPSS present differing views. In a 2001 study conducted by Zisman et al. (11), 211 patients were prospectively evaluated before biopsy and at 7 and 30 days after biopsy using IPSS. The procedure was shown to cause temporary difficulty voiding, and a transitional zone volume of 42 mL or more was associated with greater difficulty voiding and the possibility of developing urinary retention (11). However, similar to the study by Klein et al. (8), no correlation was seen between prostate volume and IPSS changes in our study. These findings suggest that prostate volume prior to biopsy is not an effective predictor of the extent of LUTS increase following the procedure. In addition, each patient in our study was assessed based on the quality of life score at the end of the IPSS questionnaire. As TRUS-Bx is an invasive and painful procedure, there was a significant deterioration in quality of life in the first 2 weeks in all groups. Subsequent questionnaires did not reveal any statistically significant differences compared to pre-biopsy values in any patient group. In a study conducted in 2003, Bozlu et al. (16) studied the effects of tamsulosin use on post-biopsy IPSS, peak flow rate, and quality of life. Sixty-six patients were prospectively evaluated and divided into a tamsulosin group and a control group. A reduction in quality of life was noted in the control group, although the change was not statistically significant. The most noteworthy finding was the statistically nonsignificant improvement in quality of life among patients using tamsulosin (16). We believe that the routine use of alpha blocker therapy will be beneficial in preventing the temporary increase in IPSS and deterioration of quality of life that were correlated with an increase in VSS in our study. The main limitations of this study are that was based on a questionnaire and included a small number of patients. TRUX-Bx causes increased LUTS in the early postoperative period, especially associated with increased voiding symptoms. The increase in LUTS is independent of patient age and prostate volume. Although we stated that we believe the placebo effect may be responsible for the earlier reduction in symptoms in the low education level group, it should be explained to patients that TRUS-Bx is not therapeutic so that patients do not neglect follow-up due to an unrealistic sense of healing after the procedure. Because the procedure is painful and may cause anxiety in the patient, quality of life was observed to drop in the early post-biopsy period. Adequately informing patients and providing effective symptomatic treatment will make the healing period more comfortable. Ethics Committee Approval: Approval for the study was obtained from the Ethics Committee of University of Health Sciences Bursa Yüksek İhtisas Training and Research Hospital (ethics committee date: 25/09/2013 and approval number: 2013/9/25). Informed Consent: All patients included in the study signed an informed consent. Surgical and Medical Practices: V.Ç., S.Ö., Concept: S.A., E.Ö., M.M.A., Design: M.M.A., M.D., Data Collection or Processing: V.Ç., Analysis or Interpretation: E.Ö., V.Ç., Literature Search: S.A., M.D., V.Ç., Writing: V.Ç., S.Ö. Conflict of Interest: No conflict of interest has been reported by the authors. Hodge KK, McNeal JE, Terris MK, Stamey TA. Random systematic versus directed ultrasound guided transrectal core biopsies of the prostate. J Urol 1989;142:71-74. Loeb S, Vellekoop A, Ahmed HU, et al. Systematic review of complications of prostate biopsy. Eur Urol 2013;64:876-892. Ganeswaran D, Sweeney C, Yousif F, et al. Population-based linkage of health records to detect urological complications and hospitalisation following transrectal ultrasound-guided biopsies in men suspected of prostate cancer. World J Urol 2014;2014:32:309-315. Klein T, Palisaar RJ, Holz A, et al. The impact of prostate biopsy and periprostatic nerve block on erectile and voiding function: a prospective study. J Urol 2010;184:1447-1452. Helfand BT, Glaser AP, Rimar K, et al. Prostate cancer diagnosis is associated with an increased risk of erectile dysfunction after prostate biopsy. BJU Int 2013;111:38-43. Fujita K, Landis P, McNeil BK, Pavlovich CP. Serial prostate biopsies are associated with an increased risk of erectile dysfunction in men with prostate cancer on active surveillance. J Urol 2009;182:2664-2669. Zisman A, Leibovici D, Kleinmann J, et al. The impact of prostate biopsy on patient well-being: a prospective study of voiding impairment. J Urol 2001;166:2242-2246. Heidenreich A, Bellmunt J, Bolla M, et al. EAU guidelines on prostate cancer. Part 1: screening, diagnosis, and treatment of clinically localised disease. Eur Urol 2011;59:61-71. Bjurlin MA, Carter HB, Schellhammer P, et al. Optimization of initial prostate biopsy in clinical practice: sampling, labeling and specimen processing. J Urol 2013;189:2039-2046. Schoots IG, Roobol MJ, Niebboer D, et al. Magnetic resonance imaging-targeted biopsy may enhance the diagnostic accuracy of significant prostate cancer detection compared to standard transrectal ultrasound-guided biopsy: a systematic review and meta-analysis. Eur Urol 2015 Sep;68:438-450. De Nunzio C, Lombardo R, Presicce F, et al. Transrectal-ultrasound prostatic biopsy preparation: rectal enema vs. mechanical bowel preparation. Cent European J Urol 2015;68:223-228. Bozlu M, Ulusoy E, Doruk E, et al. Voiding impairment after prostate biopsy: does tamsulosin treatment before biopsy decrease this morbidity? Urology 2003;62:1050-1053.